Welcome to Minecraft World! Check out our tutorials, post to the community corkboard, and come play on our free server! There have been a ton of cities and towns popping up all over the map recently, and I'm thrilled that one of them is the winner of this week's Staff Choice Awards. I'm still waiting for the other builders to complete their masterpieces on the server, and as soon as they are finished, I will definitely upload some videos of them and show them off to you all! Want to see the previous week's awards (featuring Guitar Hero)? Here you go! 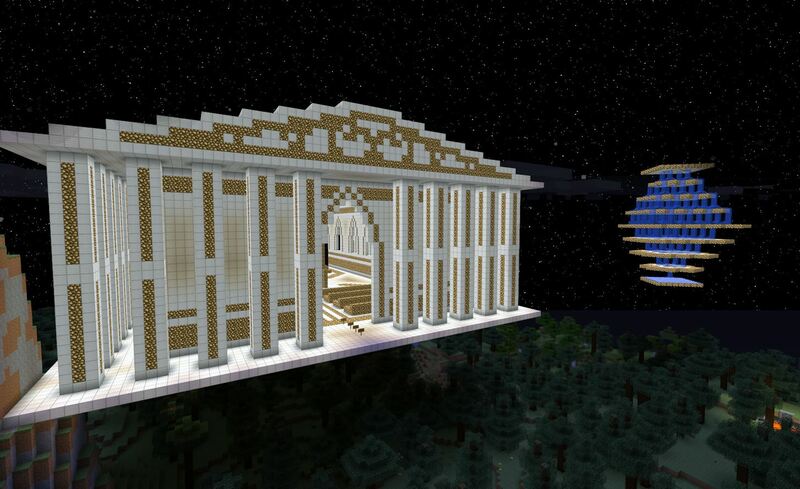 NEWDeStRoY1 has been working tirelessly on his City of the Gods, and it has certainly paid off! 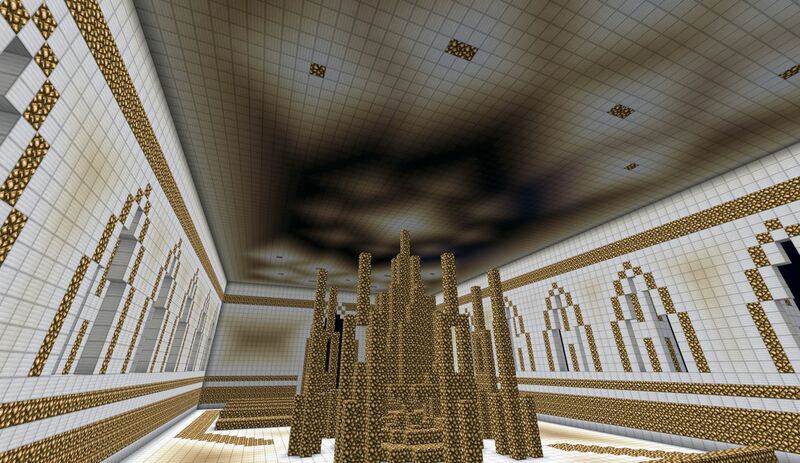 The materials used were iron blocks and glowstone, which really gave it that royal look and feel. My favorite part about the temple is the lighting techniques he used to accent the ceiling, so be sure to take a look at the pictures below! It's absolutely stunning, and if you would like to see it in-game, the warp is /warp cityofgods. Maxbeniuk2 helped him out with finishing off the pillars, so I didn't want to leave him out! The second build shown below is the Fountain of the Gods, and it's absolutely gorgeous. The way he incorporated water mechanics into the design definitely took this fountain to the next level. (1) Temple (left) and Fountain of the Gods (right). (2) Unique lighting technique casting a star pattern on the Temple's ceiling. 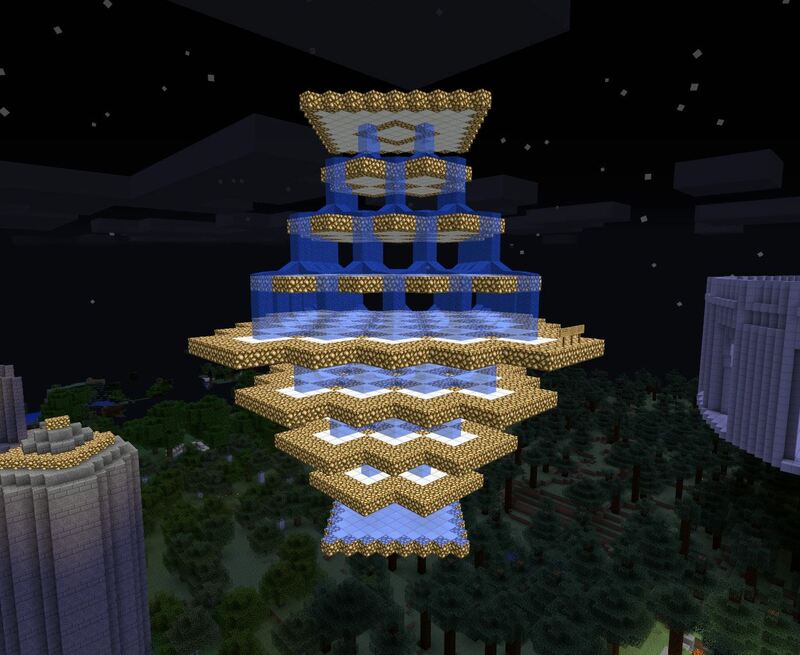 (3) The second build, Fountain of the Gods. NEWDeStRoY1 is in the process of completing another build in City of the Gods, so if you would like to help, be sure to ask! Contributor rank in game + DisguiseCraft: Iron Golem (/d irongolem)! DisguiseCraft is the exact same thing as Mob Disguise, but since Mob Disguise wasn't updated for 1.2.3, we are using this new amazing plugin. Not only does it have the option of colored sheep, but also baby animals and mobs! DisguiseCraft allows you to turn into a mob in Minecraft. 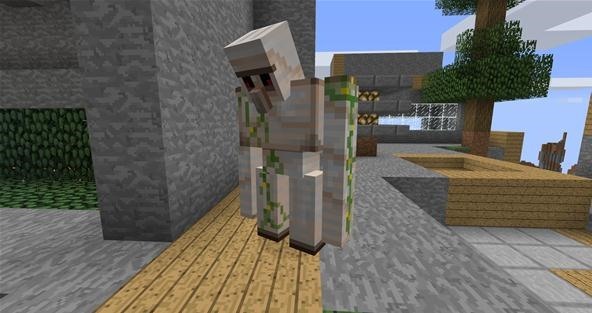 You will not see yourself as that specific mob, but everyone else will think you're actually an Iron Golem! Congratulations to the winners. You guys did an outstanding job! I can't wait to see what everyone has in store for the admins next week. If you didn't win this week, don't fret! We will be doing the Weekly Staff Choice Awards every single week. If you would like to know what prizes will be given out for the Staff Choice Awards, check out the latest Weekly Challenge to see what perks you could win! The prizes given out for the Weekly Staff Choice Awards will always be the same as the prizes for the Weekly Challenge. If you would like to enter your build for consideration, please do so by posting a video, screenshots, and some information about your build to the community corkboard. You can also message me (Maroselis) in-game if you would like to recommend someone else for that week! If I'm not in game at the time, just type "/mail send Maroselis [And your message here]" (without the quotes). The easiest way to get yourself or someone else noticed is if you /sethome NAME. Send me a message and let me know what the home is saved as, so the admins can take a look! Don't forget to hop on the server this Saturday, March 17th at 3 PM (EST) / 12 PM (PST), where we will be creating an automatic boat dock with redstone! If you need to convert the time to another time zone, try this handy convertor. We use TeamSpeak3 for our tutorials; you can download it free here. I can't use /d creeper... Guitar hero won it before the update didn't we? I saw it it was awesome! Made of only iron blocks and glowstone and still just so awesome!